Yes, it's Boobie-Thon time! 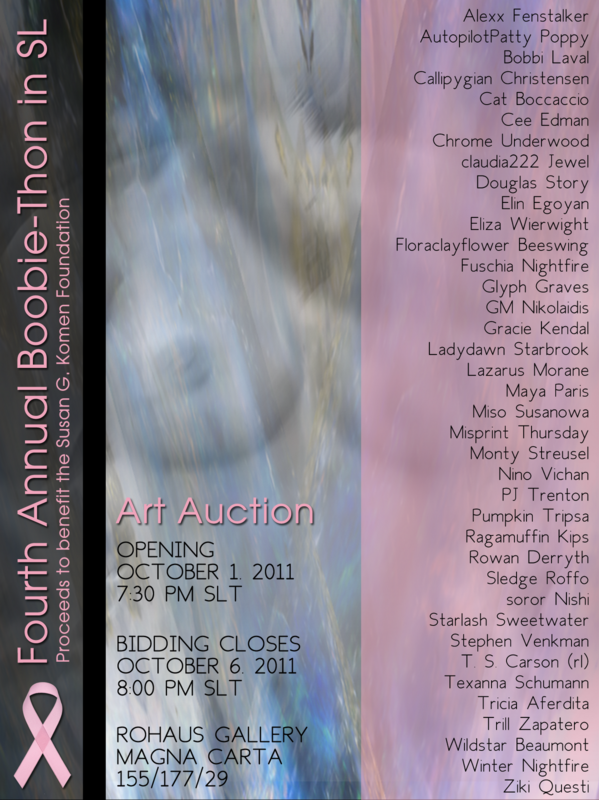 Organized by artists Rowan Derryth and PJ Trenton, the inworld Boobie-Thon is an opportunity to raise awareness of and contributions for breast cancer research, with proceeds going to the Susan G. Komen Foundation. 37 Second Life artists have contributed artworks that go up for auction later today, with bids closing on October 6th. Stop by the RoHaus Gallery in Magna Carta today (Saturday, October 1) at 7:30 SLT for an opening reception, and please consider placing a bid on one or more items! Many of the items are one-of-a-kind, and the artworks vary from 2D photos (like the one I offered) to gorgeous 3D and/or animated works—I love the one by Glyph Graves in particular. Click the poster for a larger view.